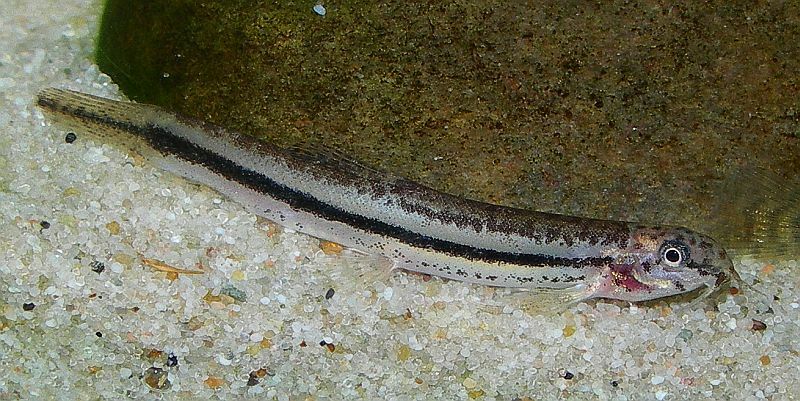 ...with caudal-fin patterning similar to L. alkaia but that on the body closer to L. guntea. Like other Lepidocephalichthys spp. it does best when maintained in a group. Apparently collected alongside the undescribed dwarf Channa species traded as C. sp. ‘Assam’ or ‘Lal Cheng’ in the Buxa Tiger Reserve, Jalpaiguri District, northern West Bengal state, India. Unconfirmed but related species are most commonly found in shallow, slow-moving sections of streams or calm habitats such as freshwater swamps, oxbows, backwaters and paddy fields. Base dimensions of 45 ∗ 30 cm or more are required. Not difficult to keep but must be provided with a soft, sandy substrate since some of its time will be spent completely buried, or with only eyes protruding. When coarser gravel is used it may become stressed or damage itself trying to dig, and feeding behaviour can be inhibited. Lepidocephalichthys spp. are generalised micropredators sifting mouthfuls of substrate through the gills from which insect larvae, small crustaceans and suchlike are extracted. L. sp. ‘LE02’ should do well alongside fishes from similar environments that occupy the upper part of the water column such as Trichopodus, Trichogaster, Trichopsis or certain Danio species. This fish may only have been exported for aquaria on a single occasion to date, the specimens in these images arriving into the UK during 2007. It exhibits characters reminiscent of both L. alkaia and L. guntea and has been referred to as L. cf. guntea but is most likely an undescribed species (Havird, pers. comm.). We’ve chosen to list unidentified members of the genus using a ‘LE’ numbering system in the absence of definitive information.